Grand Campaign "Push to the Volga" is complete. KG_Loki (aka CC_Infected_x_X) and I started this GC back in December 2016. I asked for a campaign already started as I hate beach maps. That is, attacking out of a small square against superior positions on day one. The campaign was on turn two of day one. We carried on from here until the end. Germans set to line and Russians on recruit and 15 minute games. Recruit gives the Russians more tanks and a handful of tanks in units that otherwise would not have them. We chose to view each others force pools prior to battle but not actual units chosen for the battle. We played over 300 battles playing for around 65-70 hours total over six months. 220 battles were recorded using Bandicam. They are available to watch on Youtube at Stalingrad Unedited. They are unedited and not narrated, just raw in game video. 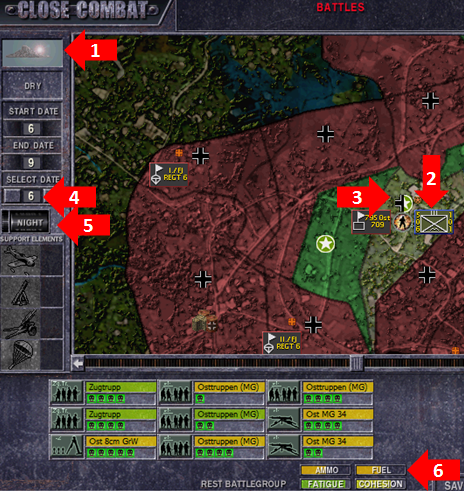 Grand Strategy - My strategy was to meet Loki's armour with mine in the center and move all my infantry units north around RO Settlements through Sculturny Park to get behind the T-34s. This flanking migration of infantry took days and careful planning that strategic moves did not get messed up. Southern strategy was to check the Russians in Grain Elevator and Southern Ferry Terminal. The southern area below Chuikov's HQ and Tsarista Crossing remained quiet for most of campaign after the Russians were pushed back to the Southern Ferry Terminal. Armour Tactics - Russian armour was very centralized, in about five battle groups. Upwards of 20-25 T-34s in four of them and 30 odd KV-1s in the fifth. Any armour losses suffered reverberated throughout the campaign so I used them carefully. Brute force could not be used against the Russians for fear of a devastating loss of armour. I was usually attacking out of a box with limited sight. My tactics were threefold to beat Russian armour. First German armour would be grouped, sometimes five tanks parked side by side. This would overwhelm any single tanks spotted. Secondly, airstrike support was exclusively targeted on enemy tanks. Finally, all my attacks had the exit VLs in mind. I was never able to force a breakthrough with these tactics but I did force the Russians back very slowly. Infantry Tactics - German infantry was far superior to Russian and more numerous. While attacking I knew my losses would be greater, and at times much greater. I learned quickly to run my men only to the outer walls of buildings, not to rush in. Once they got to the wall they would fight with grenades first then small arms all together. If I had them rush in, they would get mowed down by waiting Russians. The infantry fighting was brutal. One map in particular that was the most frustrating was Mokraya Mechetka, the northern most center map. I spent days trying to remove the Russians. The map favours defence with its deep gullies and a dry river bed bisecting the map laterally. Each gully had the steep slope terrain element which made infantry movement extremely slow. I ended up attacking from three different directions with three different units. Eventually the Loki just retreated from the map. Grand Strategy - Loki fought a delaying actions most of the game. In the first couple days Loki retreated east quickly to ensure better defensive positions. These days are crucial for the Russians. If the Germans make a breakthroughm, there are no Russian units in depth to stop them, the Russians have only a single line of defence, Loki ensured it was not broken by the early retreats. Loki's armour was deployed to center of the map, in and around RO Settlements, Mamayev Kurgan, Shooting Range, Barracks Hill and West Stalingrad. Infantry units made up the northern flank. In the south a single Guards infantry unit held the Ferry Terminal for most of the game. Armour Tactics - T-34s were deployed mainly in a static defence role behind natural obstacles and buildings. They had superior firing positions with their turrets already facing the proper direction. German tanks had to roll into their LOS and traverse to shoot. Loki's armour units were deployed to maps that favored long lines of sight and few buildings. Mamayev Kurgan is the best example of this deployment. I was disbanded two or three times attacking into this map. The KV-1s were mostly a deterrent for most of the game, they were used very sparingly. Infantry Tactics - Russian infantry was sub par is most battle groups. Loki made the best of this ambushing my men. There were two notable ambush spots. The first being in the bottom of a gully in a trench. German infantry would crest the top of the gully hitting the steep slope element and get picked off by one by less superior infantry. The second ambush spot was within ruined buildings in the second room. As Germans would enter the first room blind, Russian infantry would pick them off as they entered. I dealt with this effectively with the tactic I mentioned above, it was still costly. Russian Maxims are the top machine gun in the mod. German machine guns do not compare. Panzer3 tanks seemed superior to T-34s, Panzer4 were not. German ATRs would not perform nearly as good as Russian ATRs. Russian ATRs worked great against ATGs. Russian T-60 and T-70s are hard to destroy. They would take many hits leaving crew injured but would not die until hit with sustained fire. Stugs would get damaged in all encounters with tanks, ATGs and ATRs. Not a reliable tank. Most Stugs were gone by mid campaign. Mortars were only effective at killing standing infantry. No ATG or open topped vehicle was killed due to mortar fire. 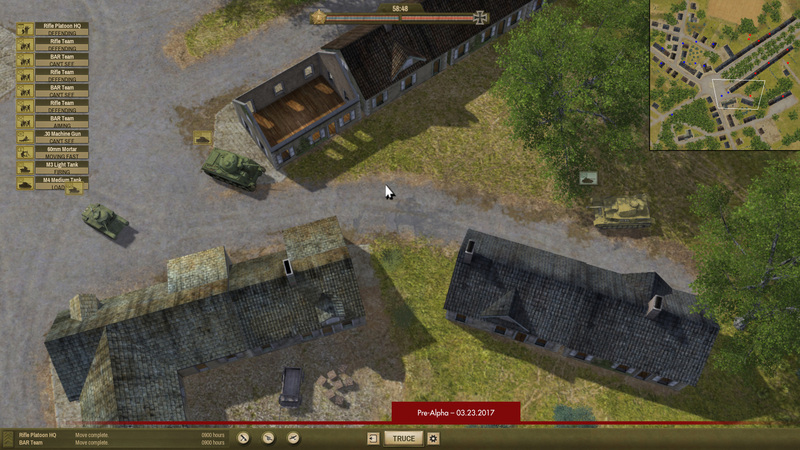 Want to download CC5 Stalingrad? Here's the Installation Guide to get you started. Steve McLaire has posted new screenshots of Close Combat The Bloody First. These are the first two screenshots since Matrix decided to restart the game on a new 3D engine back in July 2016. Right away we can recognize classic interface features from the original games and some from Panther in the Fog and Gateway to Caen. What looks to be a new feature are the time stamped messages. 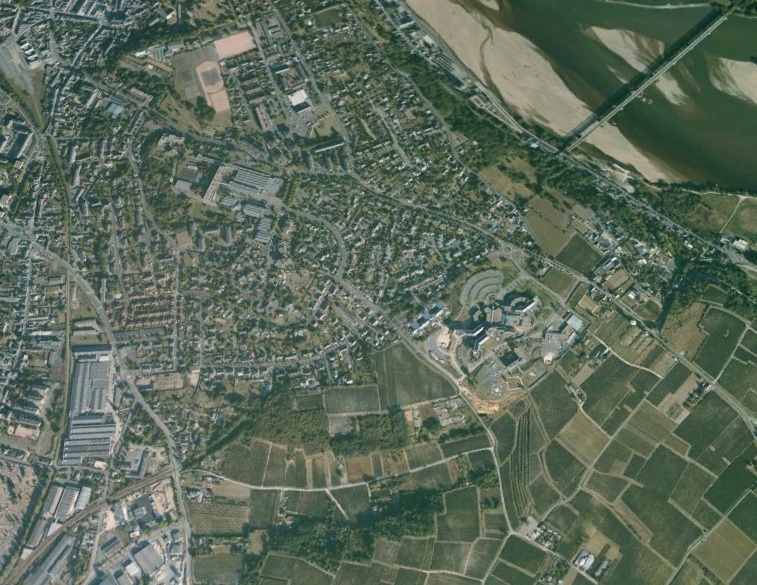 The scale of each image could also indicate a zoom feature and definitely shows more of the battlefield than Gateway to Caen does. As noted in the screenshots this is a pre-alpha version. Direct fire mortars are the most effective way for suppression and killing enemy teams with mortars. Having your mortar teams numbered for quick access will also assist in hitting your opponent fast. In the video below you will see how fast I can bring down fire on out in the open running troops. The enemy team is wiped out. I assigned the mortar team 1 by pressing CRTL+1. The input sequence of my firing is 1, v, left click, m.
Direct fire has one huge disadvantage. The team will give their position away either by rifle fire or the graphic of the mortar firing. In some versions of Close Combat the supporting members of the team will engage with their rifles. In the direct fire role you must be prepared to defend your team, they are too valuable to lose. 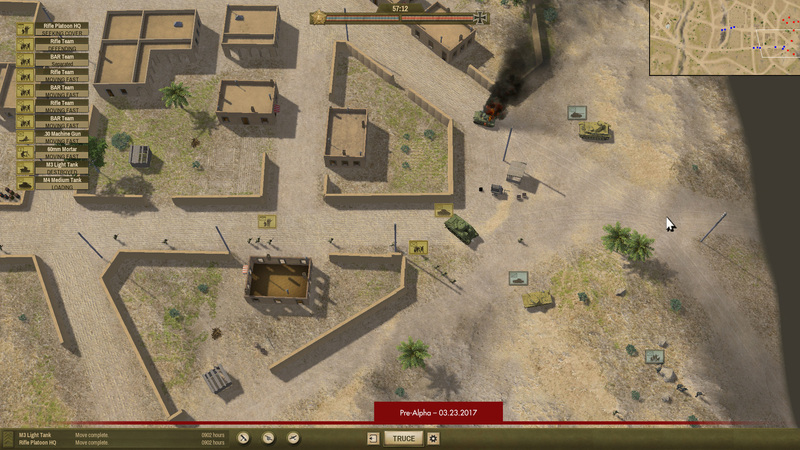 81mm mortar teams are mobile but move very slowly and have a long setup time. Using these teams for direct fire is usually a bad idea. The 60mm mortar teams are much more mobile and have a quicker setup time. They can follow an advance and bring down fire for your assaulters. There are 120mm mortars that are mobile, but moving them is as painful as moving a 17pdr ATG. Other mods have the 120mm mortars set as static units unable to move. If you decide to use direct fire, always ensure you check the mortars minimum firing distance! Have you taken an absence from Close Combat? You may have some old campaigns in your save folder with opponents still out there ready to pick up the torch. Here are some easy checks you can make when you enter the strategic screen to get back into things. You wouldn't of overlooked them when you were playing regularly, but they are easy to forget when you'v been gone awhile. Follow the steps to get back into the groove and possibly gain a surprise advantage over your opponent. 1. Check the weather. Bad weather can create muddy terrain. 2. Check composition of enemy battle group. If its infantry, leave the ATGs and Panzershrecks at home. 3. Open the map preview and check to see which road exits you own. Trace your supply line back to a friendly depot. 4. Cycle through the dates to find out what reinforcements are deploying and how much time is left in the campaign. 5. Check the time of day, and if its night. If its the last round of battles for the day use your support or lose it! 6. Check your units level of supply. Ammo, Fuel, Fatigue and Cohesion. The latter two for the rereleases. Submitted by MOOXE. No hint! Select Page 1 2 3 4 5 6 7 8 9 10 11 12 13 14 15 16 17 18 19 20 21 22 23 24 25 26 of 26 pages.